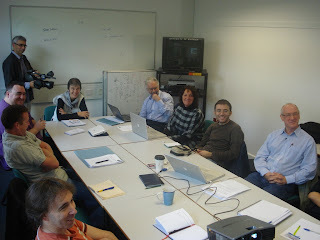 Yesterday we had a full artificial culture project team meeting in Warwick, following on from the EmergeNet meeting on Thursday (see my previous blog post). An excellent meeting, significant because we are now exactly half way through the project. Having spent much of the first two years of the project building the artificial culture lab, the project is now moving into the experimental phase. Having built our microscope we can now start looking through it. What is the effect of fidelity of imitation on meme transmission? What is the effect of selection? What is the effect of size/granularity (of the meme)? What is the effect of complexity within the meme? Here at the University of Warwick this week for the European Conference on Complex Systems. Unexpectedly, Springer also used the conference to launch their excellent new Encyclopaedia of Complexity and Systems Science. As an author of one of the articles in the encyclopaedia - on Foraging Robots - it was great to see all 11 volumes and my article, in print, for the first time. Editor in chief Bob Meyers did the formal launch last night and (perhaps not suprisingly) there were four or five contributors here in Warwick. Bob called a couple of us out of the audience to say a few words, which was great. I made the points that complexity science is a wonderful unifier of multiple disciplines - everything from cell biology to economics - and that the grand challenge is to find unifying principles of emergence and self-organisation. Today is the EmergeNET3 workshop. James Crutchfield gave a terrific invited talk about emergence, which he defines as a change in a system's causal architecture. He outlined his computational mechanics framework for analysing emerging patterns, and gave examples from cellular automata. Very interesting, but I was left wondering if Jim's framework would transfer well from the ideal grid-world of cellular automata, to the continuous time and space of swarm robotics, with rather more complex agent behaviours, real-world physics and noise. I suspect not.